Reduced summer stream flows may result in higher summer water temperatures, increasing reliance on deep pools as cool water refuge for aquatic organisms, and restricting salmonid habitat, especially in the watershed’s lower reaches. Increased winter flows may result in fish habitat erosion and scouring, increasing reliance on deep pools as refuge from strong currents for aquatic organisms. Changes in habitat availability and the timing of resource availability may affect aquatic species’ abundance and distribution. Changes in vegetation may affect bank stability and shade potential. In the future, precipitation in coastal Oregon is expected to remain a predominately wintertime phenomenon (i.e., most precipitation will continue to occur in the winter). However, the extent to which precipitation timing, frequency, abundance, and intensity on the Oregon coast may change in the future remains uncertain. There is evidence that high-intensity storms are becoming more frequent, and that the frequency of weak to moderate-strength storms is declining. Climate models suggest that summers in the Pacific Northwest will become warmer and drier; a 14% decrease in summertime precipitation by the 2080’s is predicted. The local effects of climate change may affect stream habitat in the project area through periodic wintertime increases in stream flows (from more frequent and intense storms), and summertime reductions in stream flows (from longer, dryer summers)(OCCRI 2010)(see sidebar). Recent observations in Idaho have documented rising water temperatures in lakes and streams, affecting the quality of salmonid habitat (Isaak et al. 2010). The Coos watershed may be spared the most dramatic reductions in summer stream flows, as these are expected to take place in areas dependent on snow pack (Dalton et al. 2013, Ashfaq et al. 2013); stream flows in coastal Oregon are affected almost entirely by rainfall (OCCRI 2010). Regardless, some summertime stream flow reductions are still expected, which may reduce the range of summer habitat in the Coos watershed for temperature-sensitive fish, like juvenile Coho salmon. Also, while snow pack does not affect stream flows in the project area, the lack of snow melt may render the watershed more susceptible to temperature changes than streams fed from snow pack (Mohseni et al. 1998). Such temperature changes may be particularly severe in the lower watershed, where wider, shallower waterways and lack of shade can increase stream temperatures to levels higher than salmonids can tolerate. Weybright (2011) has already documented juvenile Coho migrating upstream in the Coos watershed, concurrent with a rise in summer temperatures. The contraction of summer salmonid habitat may occur earlier and end later each year in lower watershed stream reaches. This change could result in prolonged summer crowding and associated competition for resources in middle and upper stream reaches. The multi-model mean value of water temperature rise is 7˚ F (4˚ C) by 2100 in the Pacific Northwest (Figure 1). As temperatures rise, deep pools may play a larger role in maintaining summer habitat potential than they have in the past. Goniea et al. (2006) found upstream Chinook salmon migration slowed during seasonal high temperatures (above 20˚ C) and in warmer years, as the returning salmon made temporary use of cooler tributaries as thermal refugia. Pools also provide thermal refuge during low flow events, as well as permitting fish to hide from predators (Foster et al. 2001). As low flow events become more frequent, however, average pool depth may decrease, intensifying competition for remaining deep pool habitat. The availability of pool habitat may thus become a limiting factor for Coho and other salmonid species in more reaches of the Coos watershed. Battin et al. (2007) identified minimum flow during the pre-spawning period (during which salmon return to freshwater but before they spawn) as a limiting factor for Chinook salmon in the Pacific Northwest. This may be due to a number of factors, such as temperature-related stress, increased vulnerability of returning adults to predation (due to lack of cover), and reduced access to gravel beds suitable for redd creation. Battin et al. noted, however, that the worst effects tended to be at high elevation, as climate impacts on hydrology were predicted to be greatest in these areas. This may paint a slightly rosier picture in the lower Coos watershed than that predicted by Battin, whose study area (the Snohomish Basin) received water that drained from mountainous areas well over 1,000 meters of elevation. Battin et al. (2007) also predicted that increased high flow events during the winter had the potential to scour out redds, killing incubating salmon eggs. While winter high flows may present a similar threat to Coho eggs, it is also possible that the Coos watershed may be spared the worst of this prediction, again due to the watershed’s relatively low elevation and reliance on rainfall more than snow pack (Mantua et al. 2009). The predictions in Battin et al. (2007) were based in an increase in winter high flow events in the Cascades, due to warmer air temperatures preventing snow pack and sending water downstream during the winter that would normally have melted gradually during the summer. The streams of the Coos watershed are not so dependent on snow pack due to their low elevation, meaning that the modeled impact of winter high flows may not be as severe locally. However, given the complexity and uncertainty associated with climate change (see sidebar), and given that winter high flow events already have an impact on fish survival in the Coos watershed (Weybright 2011), it may be prudent to prepare for future storm-driven changes to stream habitats in the Coos watershed. Climate-induced habitat changes may also affect the manner in which aquatic species use their habitat. For example, Crozier et al. (2011) determined that sockeye salmon migration on the Columbia River now takes place approximately 10.3 days earlier than it did in the 1940s, corresponding with a 2.6˚ C (4.7˚ F) increase in average water temperatures. In the Coos watershed, Weybright (2011) documented juvenile Coho engaging in different habitat use strategies, which he identified as summer mobile, winter mobile, summer sedentary, and winter sedentary. Sedentary fish tended to attach themselves to one particular area of a stream, usually a pool, while mobile fish moved frequently from place to place and habitat to habitat. Further, Weybright noted differences in survival rates among fish adopting these different strategies: in particular, he documented higher survival rates among winter sedentary fish compared with winter mobile fish. Given the likelihood that pool habitat will increase in importance as refuge from both summer low flows and winter high flows, the difference in survival rates between mobile and sedentary fish in the Coos watershed may increase, as sedentary fish prove more resilient in the face of habitat change. 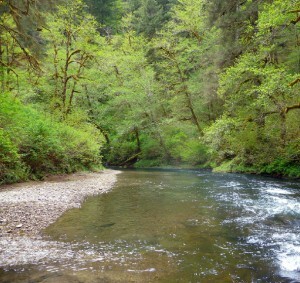 In the long run, this may result in Coos watershed Coho populations becoming more sedentary and pool-loving in their habitat use, further increasing the importance of pools and pool-supporting habitat resources. It’s also possible that concerns noted by Dalton et al. 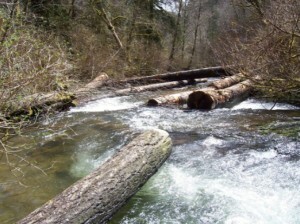 (2013) may affect the viability of aquatic species in the Coos watershed. If the timing of local salmonid life cycles and the availability of critical resources become mis-aligned (e.g., the timing of salmonid fry emergence and aquatic insect hatches), it could create a timing mismatch between resource availability and species’ needs, and the ability of the local habitat to support salmonids and other species may be greatly reduced. The exact responses of different habitat resources and different species life cycles to changes in climate are a source of uncertainty. It may be difficult to predict such mismatches in advance. The watershed’s proximity to the ocean may provide its riparian forests with some temperature relief compared with more extreme temperature increases likely to occur further inland. Considering the current scarcity of large, old riparian conifers in the Coos watershed (see Terrestrial Vegetation summary in Chapter 12: Vegetation), any climactic shift that might result in a change in conifer distribution could affect local aquatic habitats. The range redistribution of important conifers like the Douglas fir, cedar, and spruce are particularly worrisome, as these are the sort of large trees commonly found in high quality riparian habitat. Should a change in their distribution affect the Coos watershed, it could have important implications for key habitat resources like large woody debris in streams, and perhaps bank stability and riparian shade. However, it should also be noted like conifer species that are currently distributed south of the project area may also expand their ranges northward due to climate change, which could fill the gap created by local species retreating north. While the gradual shift of tree species northward may move at a relatively sedate pace, pathogens that can decimate tree communities in short order are capable of much faster movement, as they can be transported by organisms, vehicles, and even people. This range allows pathogens to adapt to changes in climate far more rapidly than tree communities, with possibly devastating results for trees. The most iconic case of such movement may be that of Sudden Oak Death. A mere six years after the first symptomatic tanoaks (Notholithocarpus densiflorus) were observed in Marin County, California, the pathogen responsible (Phytophthora ramorum) was detected by aerial survey in Curry County, OR (Kliejunas 2010). Although P. ramorum is cause for concern in itself, it also acts as an example of what may be expected from other pathogens and parasites as their range changes in response to climate change. Compared to trees, pathogens and parasites have rapid life cycles. They can also travel quickly, often with unwitting human assistance. It is instructive to examine how in a mere two decades since the first infection, P. ramorum has traveled hundreds of miles, cost millions of dollars in damages and control actions, and altered the species balance of trees in northern California, and soon, possibly, in southern Oregon. Phytophthora ramorum does not act alone. Across the planet, forest communities have changed in response to changes in pathogen ranges facilitated by climate change. On the eastern seaboard, the hemlock woolly adelgid (Adelges tsugae) is currently decimating hemlock forests (Thompson et al. 2013). Figure 1. Smoothed curves and bounds for 20th and 21st century Pacific Northwest water temperature model simulations, relative to the 1970 – 99 mean. The heavy smooth curve (black and red line) for each scenario is the weighted multi-model mean value. The top and bottom bounds of the shaded areas are the 5th and 95th percentiles of annual values (in a running 10-year window) from ~20 simulations, smoothed in the same manner as the mean value. 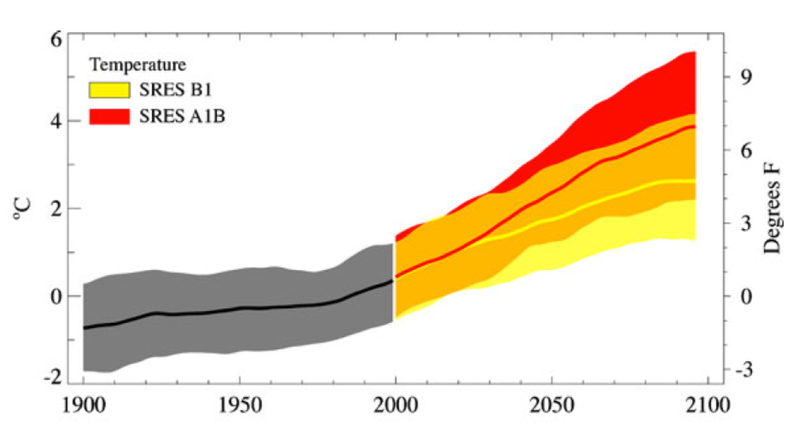 Mean warming rates for the 21st century differ substantially between the two scenarios here presented after 2020. From Mote and Salathé (2010). This parasite has moved steadily northward from its initial observation point in Richmond, VA in 1952, and is currently changing the species mix of forests as far north as Massachusetts. The parasite’s spread seems limited by cold temperatures at higher latitudes, but as warming continues, the quiet epidemic seems likely to spread. Closer to home, Douglas fir in the Coos watershed already suffers from Phaeocryptopus gaeumannii, a fungus that causes Swiss needle cast (Figure 2)(Robinson 2009). 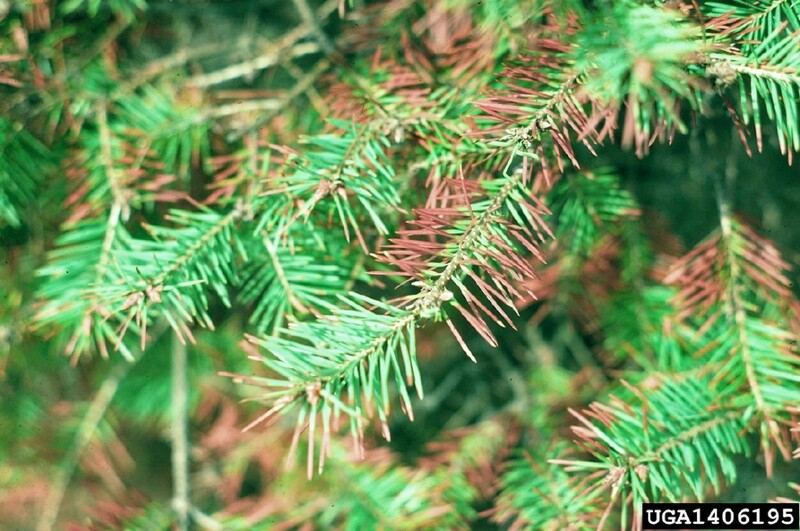 This pathogen causes fir needles to turn yellow and fall off the tree, ultimately retarding growth by reducing the tree’s ability to photosynthesize. Research by Watt et al. (2010) has established that this pathogen, like P. ramorum, is temperature-controlled, and warmer winters may facilitate its spread to higher latitudes and increase its impact in areas where it is already present. In addition to impacting the local economy, which relies heavily on Douglas fir as a commercial product, Swiss needle cast has the potential to negatively impact the growth of a key riparian conifers, affecting stream habitat quality throughout the watershed. To manage for these uncertainties, climate scientists use multiple models (“multi-model ensembles”) that incorporate the estimated range of possible natural variability, climate sensitivity, and future greenhouse gas emission values when investigating climate-related change. The models typically generate a range of values for potential future air temperatures, ocean surface temperatures, sea level rise, etc., which naturally become increasingly variable the longer into the future the model predicts. This approach gives communities a range of projections to consider when developing climate change vulnerability assessments and adaptation plans. Ashfaq, M., S. Ghosh, S. C. Kao, and N. S. Diffenbaugh. 2013. Near-term acceleration of hydroclimatic change in the western U.S. Journal of Geophysical Research: Atmospheres. 118(19): 10,676-10,693. Battin, J., M. W. Wiley, M. H. Ruckelshaus, R. N. Palmer, E. Korb, K. K. Bartz, and H. Imaki. 2007. Projected impacts of climate change on salmon habitat restoration. Proceedings of the National Academy of Sciences 104 (16): 6720-6725. Dalton, M.M., P. W. Mote, and A. K. Snover [Eds.]. 2013. Climate Change in the Northwest: Implications for Our Landscapes, Waters, and Communities. Washington, DC: Island Press. Foster, S. C., C. H. Stein, and K. K. Jones. 2001. Oregon Department of Fish and Wildlife, A Guide to Interpreting Stream Survey Reports. P.A. Bowers [Ed.]. Information Reports 2001-06. Portland, OR. Isaak, D. J., C. H. Luce, B. E. Rieman, D. E. Nagel, E. E. Peterson, D. L. Horan, S. Parkes, and G. L. Chandler. 2010. Effects of climate change and wildfire on stream temperatures and salmonid thermal habitat in a mountain river network. Ecological Applications 20(5): 1350-1371. Kliejunas, J. T. 2010. Sudden oak death and Phytophthora ramorum: a summary of the literature. 2010 edition. Gen. Tech. Rep. PSW-GTR-234. Albany, CA:. U.S. Department of Agriculture, Forest Service, Pacific Southwest Research Station. 181 pages. Mantua, N., I. Tohver, and A. Hamlet. 2009. Impacts of Climate Change on Key Aspects of Freshwater Salmon Habitat in Washington State. In The Washington Climate Change Impacts Assessment: Evaluating Washington’s Future in a Changing Climate, M. M. Elsner, J. Littell, L. Whitely Binder [Eds. ], 217-253. The Climate Impacts Group, University of Washington, Seattle, WA. Mohseni, O., H. G. Stefan, and T. R. Erickson. 1998. A Nonlinear Regression Model for Weekly Stream Temperatures. Water Resources Research 34: 2685-2692. Mote, P. W. and E. P. Salathé. 2010. Future climate in the Pacific Northwest. Climatic Change 102(1-2): 29-50, doi: 10.1007/s10584-010-9848-z. Oregon Climate Change Research Institute (OCCRI). 2010. Oregon Climate Assessment Report, K. D. Dello and P. W. Mote (eds). College of Oceanic and Atmospheric Sciences, Oregon State University, Corvallis, OR. Watt, M. S., J. K. Stone, I. A. Hood, and D. J. Palmer. 2010. Predicting the severity of Swiss needle cast on Douglas fir under current and future climate in New Zealand. Forest Ecology and Management 260 (12): 2232–2240. doi:10.1016/j.foreco.2010.09.034. Weybright, A. D. 2011. Juvenile Coho Salmon Movement, Growth and Survival in a Coastal Basin of Southern Oregon. Thesis (M.S.) — Oregon State University.